Menorca is the most low-key of the Balearic Islands, with exquisite beaches and historic towns rather than world famous night clubs. The island boasts stereotypically beautiful shorelines, ranging from calm seawater pools suitable for children to secluded coves with rocks to dive from. Although it cannot compete with Ibiza’s nightlife, Menorca’s vibrant bars and restaurants are certainly worth a visit. For example, ‘Cova d’en Xorio’ nestles inside caves high above the sea in Cala en Porter and is the perfect bar for drinking in a gorgeous sunset. A local favourite drink is gin mixed with bitter lemon known as a ‘pomada’. The cuisine comprises mainly fresh and healthy Mediterranean produce. To fit in with the locals, remember that lunch is usually 2pm and dinner is hardly ever before 9pm. Look out for the delicious local Mahon cheese or sweets known as ‘flaons’. Menorca’s scenery is fantastic for cycling as the landscape is mainly flat with 216km of stunning coastline. Whilst touring the island, make sure you visit Old Ciutadella in the west. Here you can stroll down cobbled streets and admire the colonial architecture. There’s also a delightful market selling fresh, local fish. A great time to see Ciutadella is during the energetic ‘Festes de Sant Joan’ in late June. A three day festival which involves men parading sheep, riding well-groomed horses, jousting and firework displays. If visiting the capital in the east, Mahon, then a trip to nearby Fort Marlborough is a must. Built in the 18th Century by the British, this landmark gives a fascinating insight into Menorca’s colonial past. 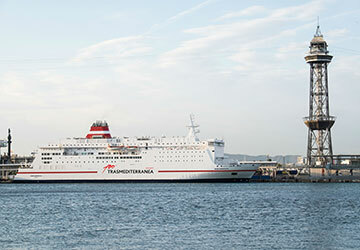 Barcelona, Valencia and Mallorca provide ferry routes taking you to Ciutadella and Mahon. Sailing from Alcudia and Palma in Mallorca lasts around 2 hours with frequent services. The port in Barcelona offers high speed ferries to Ciutadella and Mahon, whilst ferries from Valencia take around half a day with 1 sailing a week. These routes are operated by Balearia, Trasmediterranea and Iscomar, whose fleets comprise large, comfortable and reliable ferries. Smooth operation, good timetables (was able to get a decent sleep). Cabin with window view to Corsica's lights. I found the service to be very good. I did not use the catering facilities. What a fabulous boat. Although full, the public areas were not crowded, apart from the sun deck and pool area. We cannot comment on the catering facilities as we had brought our own food on board, but the choice of three restaurants, including one for fine dining was excellent. The only downside to the trip was that although leaving pretty much on time we docked at Livorno an hour later than scheduled and, as we have a camper, we were about last to disembark - an extra wait of 45 minutes... We will certainly use Corsica Sardinia Ferries again! "Practical Way to Access Italy"
Ferries from Barcelona to Italy, Sardinia, Corsica give an opportunity to access more remote parts of Europe from UK without that long haul through France and/or Germany. These ferries represent very good value taking into account time saved, petrol saved and an overnight stop on board. For more information, please visit our Ferries from Mallorca to Menorca page. For more information, please visit our Ferries from Spain to Menorca page.